The MPTS Spirit Rock is a wonderful way to announce birthdays, accomplishments, celebrations, upcoming school events, or recognize your favorite MPTS teacher or staff member! The rock is available for DAILY rental to families and staff who are members of the MPTS PTA. The cost is $10 per day. All proceeds benefit the MPTS PTA in supporting school programs. 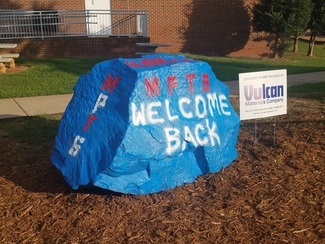 You must be a member of the MPTS PTA to reserve the rock. Not a PTA member yet, please go to www.myschoolanywhere.com to pay your fees prior to signing up. MPTS PTA reserves the right to block dates for school use. If a date is not shown on the schedule then it is reserved for school use. Daily rental begins at 5 pm the day BEFORE your reserved date. For example, if you reserve November 12th, you may paint beginning at 5pm on November 11th. You will receive an email a few days before as a reminder. If you have questions regarding timing, please email [email protected]. Payment MUST be submitted online in order for reservation to be made. To avoid timing issues and overlapping reservations, all reservations MUST be made via the sign-up genius site. Payment will show pending until fully approved. If payment is not made immediately, pending reservations will be deleted (usually within 30 minutes). Renter provides all paint and supplies needed. The recommended paint to use is spray paint. You will probably need 2-3 cans for a good base coat. It will depend upon the color you are using, the color already painted on the rock and weather conditions. It is suggested that you cover the prior message with white paint prior to painting. Remember, latex paint or paint that is rolled on will take longer to dry. Renters are renting the whole rock so you can paint on all sides. Area around MPTS Rock must be kept clean and neat. NO profane words, symbols, or derogatory/offensive messages will be permitted. The PTA reserves the right to remove content. We look forward to seeing some rockin’ rocks!